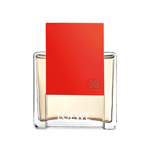 The fruitiest and most luminous variant of Aura Loewe. A light, fresh, natural eau de toilette that evokes elegance and femininity at their purest. This carefree fragrance emanates an energy that is addictive, magnetic, mysterious and unpredictable, with notes of amber, rose otto and Loewe's signature leather. Either you have it or you don’t.